Freedom by the Sword: Can We Honestly Say that the USCT Story is Still “Forgotten”? Can We Honestly Say that the USCT Story is Still “Forgotten”? Something about that phrase bothered me, and the question that eventually formed in my head was – is it still fair to portray the story of African American Union soldiers using terms like “unsung,” “forgotten,” and “neglected”? Now, I’m in no way suggesting that we have exhausted the field – far from it. 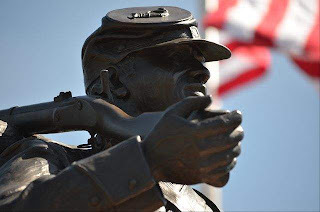 But I think we have achieved a level of general awareness of the contributions made by US Colored Troops to stop claiming that they have been relegated to the sidelines of Civil War history. I don’t fault the event organizers for using such language – having been in the field of public history for 15 years, I certainly sympathize with the person who wrote the advertisement. You’re not going to draw a large crowd by using bland language that doesn’t “hook” the average person who could care less about history. That being said, what do you think? Would you still consider the saga of United States Colored Troops a “forgotten” aspect of Civil War history? Hmm...I'm pretty sure there's a monument to the 2nd USCT in Florida that I thought was related to Olustee. In any case, that is amazing that so many sites that you would think to be obvious for having a USCT marker actually don't. Seems like the Sesquicentennial would be a perfect time to remedy that!